The faith community of St. Gianna’s, believes that faith formation is a lifelong process and that parents are the primary spiritual and moral educators of their children. We believe that the most important gift parents can give their children is a strong foundation in our Catholic faith. The faith of the parents so profoundly impacts their children, that there is no substitute for parental involvement in their children’s faith formation. 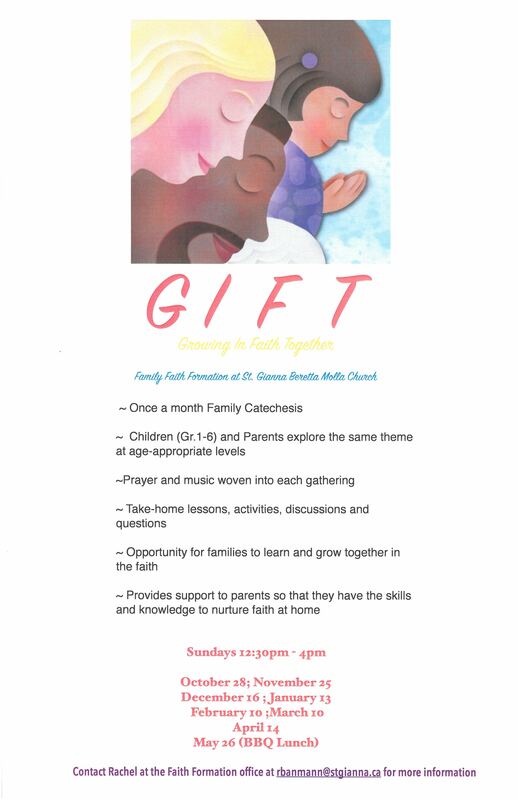 The Family Faith Formation process at St. Gianna’s is not a process between the children and the catechists alone. It involves both the immediate family and the church family. It does not replace catechesis that stems from the home but has the priveledged responsibility to support it. This catechetical experience is made complete when parents and families are examples of the faith. Families are strongly encouraged to participate regularly in weekend liturgies and Holy Days. They are encouraged to regulary participate in the Sacraments, serve in Parish ministries, live the Gospel, pray and talk to your children about their faith, live lives of service, and continue in their own personal faith formation. This year, our Faith Formation process launches a new and fresh approach to children’s faith formation. Beginning in October, parents and children are invited to come and learn about our Christian Catholic Faith together. Families with children in Grades 1-6 will explore and discover the great gift of our faith in meaningful and interactive ways. Prayer and music, hands-on activities and discussions will be a part of each of the gatherings. Families will have the opportunity to learn and grow together in faith with the support to develop the skills and knowledge to nurture faith-learning at home. The gatherings will be held one Sunday per month, October to May, beginning immediately following the 11:00 a.m. Liturgy and concluded by 4:00 p.m. This whole family faith formation process is replacing the current Wednesday Evening Weekly session. The home is the most important place by which religious faith and practice is transmitted. This is why The Catechism of the Catholic Church calls the home, the domestic church. When households practice faith at home, everyone can grow closer to God. We are proud to introduce “FAITH! – Faith Alive In The Home” at St. Gianna’s Parish. FAITH! brings specially curated resources to your family so that you can keep the faith alive in your home. Each fun and interesting video, prayer, song, activity, ritual and gospel reading will help the entire family learn more about their faith and give them practical, fun and engaging ways to ‘do’ faith at home. These resources will be updated often to reflect the ongoing life of the church and special themes. They will be delivered in fun and interactive ways and they can be completed in about 5 minutes or less whenever and wherever you want – all you need is your computer, iPad or smartphone and internet access! What a great way to infuse faith in our everyday, busy lives! Our hope is that FAITH! teaches, encourages, equips and empowers families so that their homes are more faith-filled, evangelizing and centred upon Jesus Christ. Click on our new FAITH! link below! 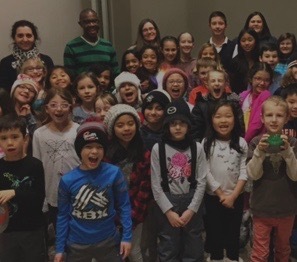 To register your family for our 2018/2019 experience or for more information, please contact Rachel Suarez-Banmann at [email protected] or use the inquiry button below.